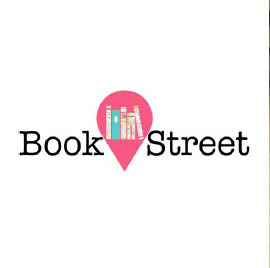 BookSteet is an eclectic mix of curated vendors and activities centred around literary art, books and content creation -- organized by the National Book Development Council of Singapore with the support of the SMU. Special Showing: You may enjoy watching highlights of Going Cardboard - a board game documentary - while battery lasts. We are honoured to support Singapore Kindness Movement - Let's Makan from July 2014. Your Rewards: Know your neighbours better & have a good time over the meal, in addition email us to buy our games with discounts! To get started: Sign up for Makan Session here. We were back to DSO for a 2nd Year. We were pleased to offer more new, unique & exciting titles to the crowd. 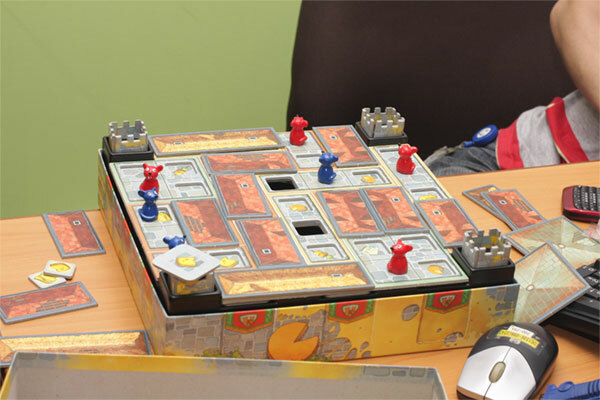 We brought along Tikal, a classic strategy game, which soon attracted 3 explorers coming into actions. After explaining the game-rules, they proceeded to play with only occasional asking for clarification. We didn't quite follow how the game progressed as we were busy attending to enquiries & purchases, but the white-shirt guy won the game eventually. 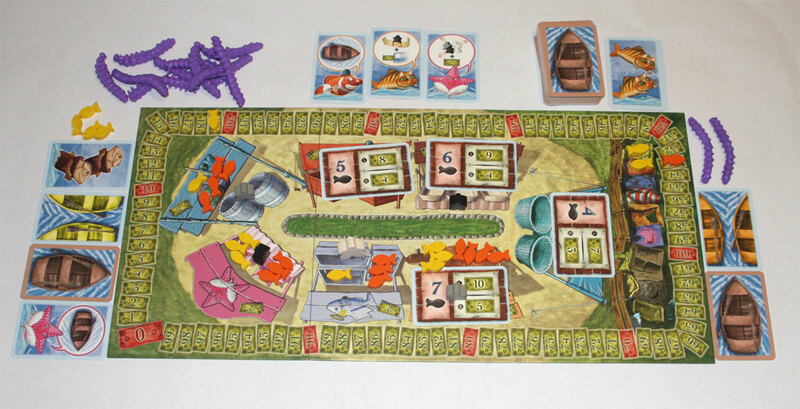 Another game played was Hamsterrolle. 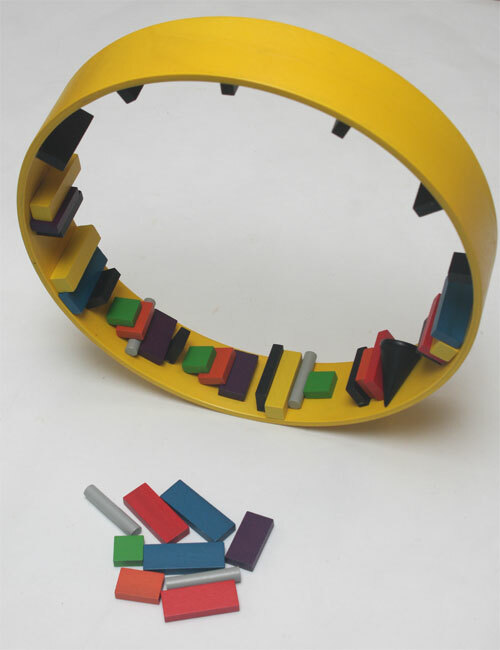 It was nerve-wracking for players placing their pieces precariously on the wheel as well as for the audience. One lady had to pick up the cone as she had caused its fall. Just when we thought it is hopeless for her to attempt any recovery, she skillfully and strategically placed all her pieces on the wheel and won! The audience burst into applause. After the game, she decided to drop the game she had intended to buy, and forked out more money to bring a Hamsterrolle home instead. We had a mini Crossboule tournament in a room. 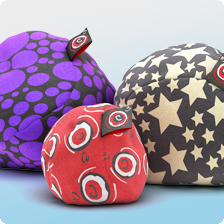 Good thing of Crossboule is that it can be played almost anywhere as the ball can land and stay on almost any terrain. We threw the tiny red target-ball towards a forest of office chairs. Sometimes it perched on the chair-base; sometimes it hid behind a chair. From the same spot, participants took turn throwing their balls towards the target-ball while trying to ensure the projectile was not obstructed by the chairs. One guy of the name Alex, if we remember correctly, almost always hit the target-ball with ease, impressing everyone on the scene. Celebrating the 47th National Day, 47% of our games will be sold at a special discount. If you buy certain titles, you can buy any 2 other games with even more discount! 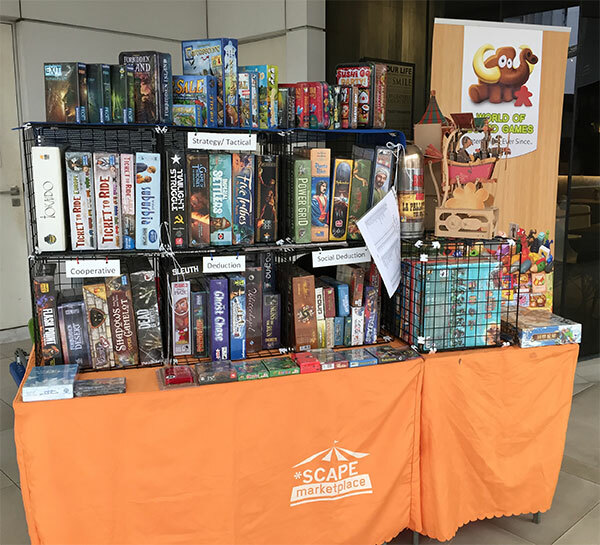 Grab games at special bazaar prices! 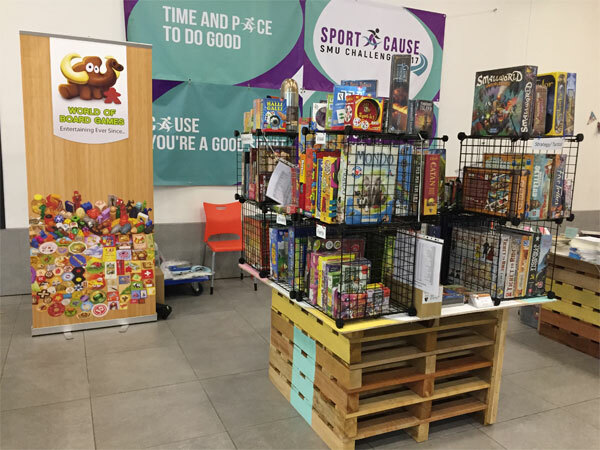 If you want to try out certain games, please email to sales@world-of-board-games.com.sg as soon as possible by 3 August. We will try to fulfill your request if we have an opened set. 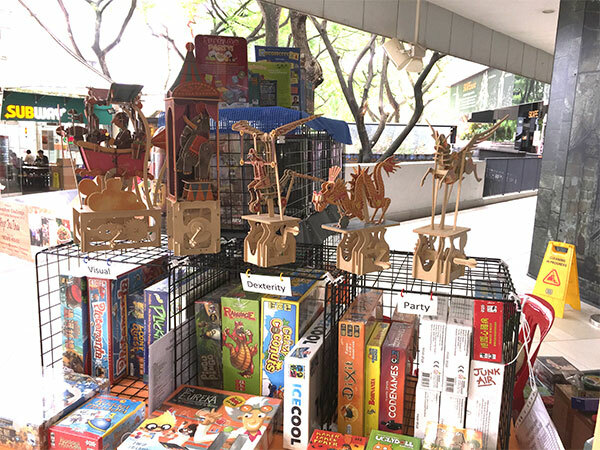 We had the honour of participating in a National Day bazaar in DSO. We offered to let people try out Chateau Roquefort. 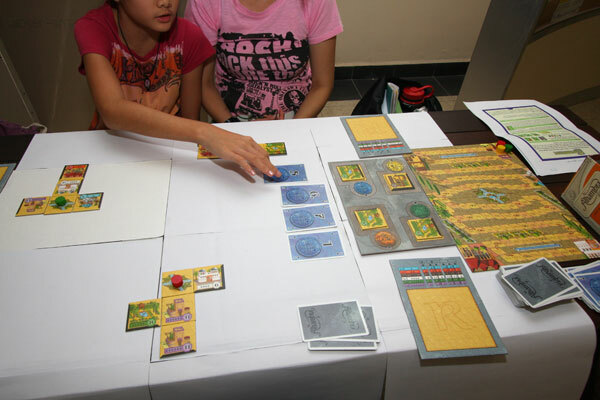 The game was set up on a table with the tiny mice staring at the people. Shyness kept some curious people from drawing the seat. One tall guy took the plunge with a yell; all of the sudden people started closing in. Upon listening to the game rules, one lady exclaimed that the memory challenge will be no-brainer. However, her quest was not plain sailing, as fellow mice tried to thwart her ambition by shifting the cheese tiles under the roof. After a game or two, the tall guy plonked down his money to grab a copy of the game before disappearing. After a while, he came back with the Chateau Roquefort he just bought, grabbing a colleague along. As if the game were a Christmas gift, he tore off the shrink-wrap hastily, and named the game components with enthusiasm. While seeing the game being set up, the tall guy's colleague remarked that the game looks difficult. We appeased him that the game can be taught in 5 minutes. Before long they were glued in the seats playing Chateau Roquefort round and round. At this time, I flashed out my camera trying to capture the fun in progress. Perhaps too embarrassed to be seen in Stomp enjoying such cute game in an adult body, he requested not to capture his face. Ok... so only his elbow was recorded in the photo. I met up with Alice & Claudia on a bench in Toa Payoh CC. 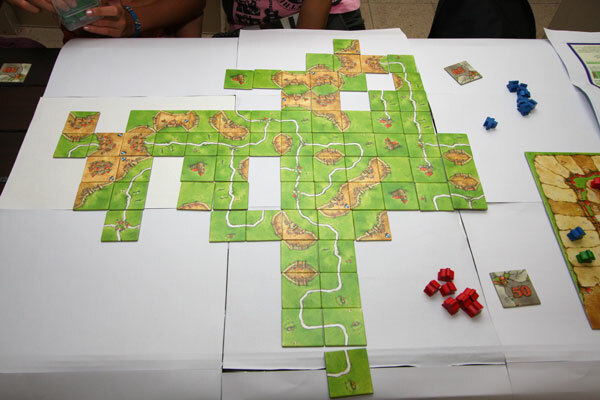 They have not played designer board games before, but Alice was very eager to try her hand on Carcassonne, Dominion & Alhambra, so much so that she had printed out and read the rule books before coming. I was very moved. Soon I taught them and they picked up the games very fast. 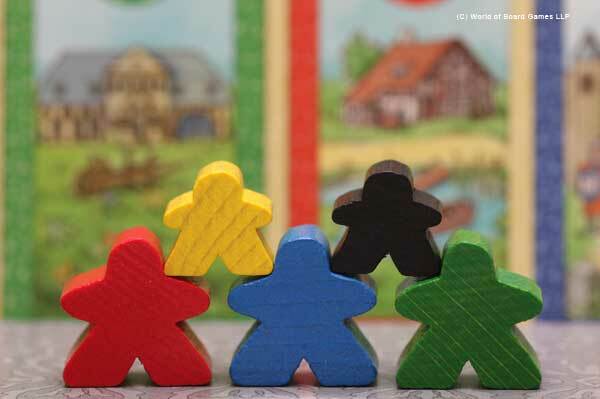 This photo shows the end of the Carcassonne game, after scoring was done. Alice had claimed the big castle on the left side, but it was too late to be completed. Claudia learnt quickly how to place tiles without benefiting Alice. Alice gamely protested, but Claudia was smart enough not to be swayed. I won the game (of course, hehe), and Claudia was happy that she beat her mummy. As time was running out, we played only a few turns of Dominion until they got the hang of it. Alice liked the design of the Dominion cards very much. Then we moved on to Alhambra and played until the first scoring with smile on their faces. At the end of these games, they were happy to have played them. As they had only played MOXXXXLY before, I said "Once you have played designer board games, you'll find them to be much better." - "Yes, yes" they nodded in unison instantly. 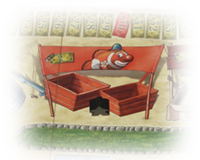 This reminded me of the time when I had my first taste of the designer board games. After a round of Ticket to Ride & Saboteur, I was wowed and wanted to play again.